The Aaron Kwok Fu Sing, Tony Leung Ka Fai, Charlie Yeung Choi Nei and Aarif Rahman (Lee Chi Ting) starred COLD WAR 2 (HONG JIN 2) will open this summer. Aside from the aforementioned original cast members, Chow Yun Fat will join the cast. The film yesterday released its first concept poster and trailer. Leung Ka Fai, Kwok Fu Sing and Chow Yun Fat kept taking aims at each other. The Kwok Fu Sing played police commissioner Lau Kit Fai first issued a warning, "If you take another step, I will start a war with you!" Leung Ka Fai as Lee Man Bun replied boldly, "I am happy to comply!" Ka Fai said, "How can I so easily concede, this time I am absolutely prepared to show you Lee Man Bun with a lot of 'depth'." In the trail Chow Yun Fat appeared in a suit and glasses. 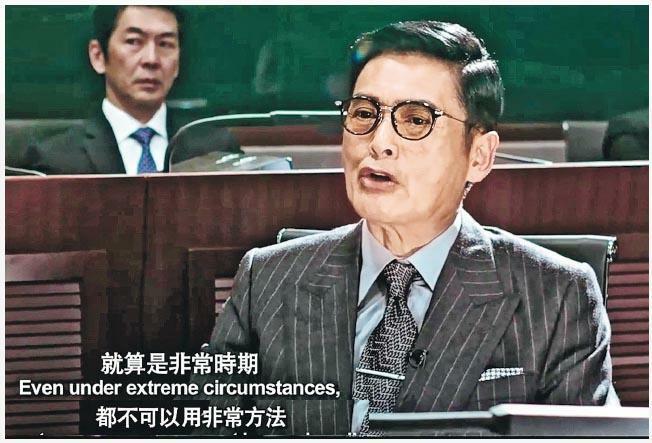 Following 4 years ago Andy Lau Tak Wa's guest starring role as the Security Bureau Secretary had classic line, "Under extreme circumstances you take extreme measures." Chow Yun Fat as the judge in COLD WAR 2 displayed his presence with "Even under extreme circumstances, extreme measures can't be used."